Ancient Order of the Hibernians Tara Division is a Catholic Irish-American Fraternal organization and one of the regular sponsors for the Theatre Gael and the Atlanta Saint Patrick’s Day parade. They also hold an annual golf tournament for the benefit of the Tara Division’s charitable foundation, Aesdana. In medieval Irish society, there existed a class of professionals, the poets and lawgivers, named Aesdana. Roughly translated, Aesdana means “men of culture” or “men of the arts.” A Section 501(c)(3) corporation, Aesdana afford Tara the means to demonstrate its commitment to Irish culture and activities. The Tara Division is also committed to the AOH goal of a united Ireland. Hibernian Benevolent Society of Atlanta, founded in 1858 by a group of Atlanta merchants, has approximately 300 members and promotes Irish culture in the Atlanta area. The Society has sponsored the annual St. Patrick's Day Parade since 1858. The HBSA has also sponsored the annual Hibernian Black Tie Ball the evening before the Parade, the St. Patrick's Mass and numerous other activities. 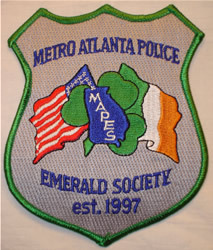 Metro Atlanta Police Emerald Society In addition to promoting a sense of pride in our Gaelic heritage, MAPES was established to recognize the accomplishment and contributions made by fellow Gaelic law enforcement officers within the Metro Atlanta Area. MAPES provides an environment that fosters a spirit of brotherhood and fellowship amongst its members and is dedicated to assisting needy families in the event of hardship. The organization is committed to enhancing professionalism within the law enforcement establishment and developing an atmosphere in which the police and community work together to reduce crime. Firefighter's Emerald Society of Metropolitan Atlanta was formed to provide a fraternal association for firefighters throughout the Metro Atlanta area. Their goal is to take care of the families of firefighters in need and to inculcate and preserve the history of the Irish in the Fire Service. The Irish had a very significant role in the establishment of the Fire Service in the Metro Atlanta area, as Matthew Ryan was the first career Fire Chief of the Atlanta Fire Department. Father Thomas O'Reilly, a "right off the boat" Irishman, saved Atlanta City Hall, the Fulton Court House and several churches from being burned during Sherman's "March To The Sea". CCÉ South is a US region of Comhaltas Ceoltóirí Éireann (pronounced "kol-tus kyol-tori air-in"), or CCÉ for short. The region is based in Atlanta. Irish Music Traditions supports Irish music, dance and culture in Atlanta. Their sponsored activities include concerts and regular ceilis (dance workshops with live music and food). They meet monthly. For more info, call 404-659-7642. Emory University Celtic Club student organization sponsors lectures, poetry readings, concerts, theater and literary events at Emory. The club continues to work to establish a Celtic Studies Program at the university, 404-727-6474. Irish American Club of North Georgia 770-578-4828. 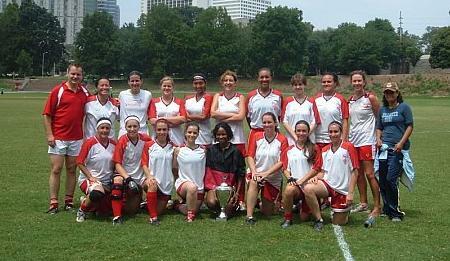 Na Fianna LGFC, founded in 2003, is a Gaelic football club for women based in Atlanta, GA. We are a diverse group of women playing football in an energetic, fun, and competitive environment. In 2007 Na Fianna won the South Eastern Divisional competition. Want To Play! The St. David's Welsh Society of Georgia actively promotes the culture and heritage of Wales in the Atlanta area. Anyone interested in Welsh matters is encouraged to attend their monthly meetings held on the second Sunday of each month from September through June. For more information please visit the Society's web site or call 678-319-0817. The Caledonian Society of Alabama was formed to preserve and promote our Scottish Heritage. Although members are primarily located in the Birmingham area, we have members in all areas of the state plus adjoining states. Shoals Celtic Concerts. The very best in live Celtic music is presented in Florence by Shoals Celtic Concerts. Since its creation in 2003, the SCC has brought Jim Malcolm of Old Blind Dogs and Teada' to North Alabama for live performance. The Celtic Music Society of Montgomery, founded in 2002, is dedicated to presenting Celtic acoustic music in private settings. Their highly successful concert series has introduced hundreds of new fans to Celtic music. CMSM is always looking for new friends to help with their quest. For more information, contact Gwen Orel at gwenorel@knology.net or Chris and Lori Fly at celticgator@hotmail.com. Comhaltas Ceoltóirí Éireann (CCE) is an internationally dispersed organization with over 400 branches worldwide. As a local branch in the Birmingham area, CCE is committed to carrying on the mission statement of "Promoting the Culture and Arts of Ireland at Home and Abroad through Music and Dance". Comhaltas national is a non-profit organization with a 501c3 status. The Birmingham CCE branch is very active in the Birmingham area. Please feel free to contact Marty Bostick (Chairman) at the following: 205-640-8976, marbos@alcce.org . Visit them at http://www.alcce.org/alcce/index.php .